Scribbled, Soiled Currency Notes Now Have Zero Value! This news has been around since last 2 years (read below), however, banks have started implementing it across India with effect from 1st June, 2015. According to notice put up in State Bank of India, they will not accept any notes that have something written on them. Here is the complete notice. While the policy was announced nearly a year back, and banks were asked to implement it from January 1st, 2014, it was not enforced by banks. However, it will not be strictly implemented to ensure clean currency notes. Having their own names printed on currency notes and coins has been the ultimate fantasy of rulers since time immemorial. If we observe the coins minted during last 1000 years, then we can observe that rulers across all periods have attempted to make their names immortal by placing their faces and/or names on currency tools. As rulers changed and kingdoms replaced other kingdoms, so did the names and faces minted on coins and currency notes. But the irony is that, even after 64 years of Indian independence, there are some citizens who still feel the same, and they are not shying away from scribbling their own names or their loved ones on currency notes. And, then there are those who write phone numbers, messages and what not! They might not be aware, but Indian Government loses crores worth of currency notes, as they are defaced by scribbling on them. This time, the government is acting tough on this practice, and has issued notifications that starting from January 1, 2014, banks will no longer accept any currency note which has been scribbled and defaced. This current notification by RBI is in continuation with its Clean Note Policy, wherein they had directed all bank employees to stop stapling note bundles and writing numbers/names or any other thing on the currency notes. 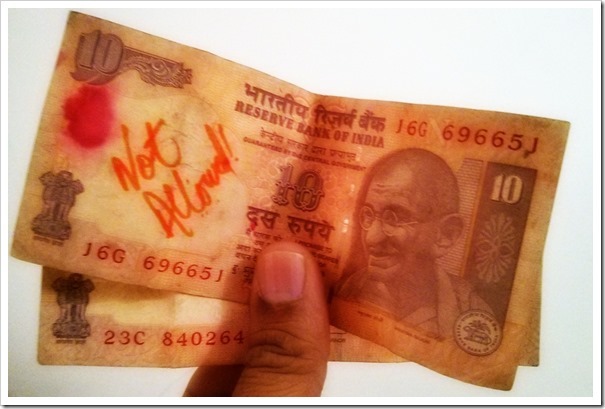 Few would be aware that scribbling on currency notes is a punishable offence in India. Under Section 35A of the Banking Regulation Act 1949, RBI has clearly mentioned that writing and/or scribbling on currency notes and distribution of such defaced notes is punishable and can carry penalty as well. But time and again, we regularly come across instances when people violate this rule. In the past, newspapers and publications have consistently highlighted this issue and even shared stories how this practice negatively affects Indian economy and as a result thousands of crores of rupees are wasted every year. We believe that growth and progress of a nation should start with us. Responsible citizens should be aware that such immature and irresponsible behavior will only bring our economy down and halt our economic progress. We request all our readers to spread this message and stop scribbling and defacing currency notes at all levels. Update Nov 23rd 4pm: RBI has not yet officially acknowledged this announcement; but the news has been widely spread over news and social media. We have sought a confirmation from RBI related to this, and still waiting for any official reply from their end. None the less, even if the news is not true, we as responsible citizens should abstain from writing anything on currency notes as it brings down our economy; and moreover writing anything on currency notes is punishable by law. So why to do it? We will keep you updated on this news. "[Updated] Scribbled, Soiled Currency Notes Now Have Zero Value! ", 5 out of 5 based on 1 ratings. Headlines like this promotes confusion and nothing else. This is bogus news and the SBI manager who posted that notice needs to be fired for superseding the RBI and behaving autocratically to harass customers. RBI notification is a directive for banks not for public. Please stop spreading these stupid rumors. And SBI has no right to impose it on customers. 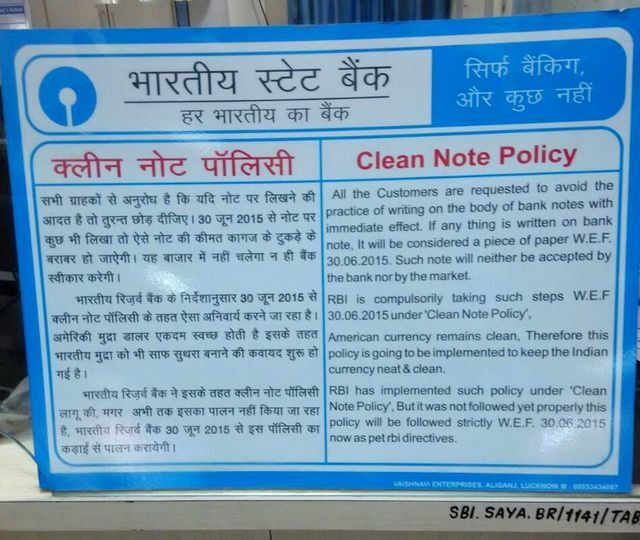 I will go to the police to report such cases if I see any such notice in a bank branch. I guess the first thing is to restrict the person at the bank teller as they are the ones who have started this practice of scrobbling numbers on the currency notes. It may be practically impossible to get this implemented hence banks need to take the responsibility and exchange such notes. I completely agree with you dear, it is cashier’s general practice… they always use to write on the notes. Today I have appealed on the facebook that whenever you see any cashier writing on note please record with mob. and complain to their respective branch manager and put it on facebook for viral…. Before I would say anything about what RBI tells people, I would like to bring basic issues to fore. 1) Who is RBI to tell Indian citizens what it feels? We are not bound by RBI or what it says. RBI is there to serve us not the other way around. 2) The Government elected by us, in order to maintain a financial system in the country created RBI to manage certain functions. Printing currency is one of them (in addition to finer duties of inflation control, monetary policies etc). 3) What is currency notes? In order not to go back to barter trade times, Govt through RBI is printing money which is a form of giving comparable value to various assets. Everything under the Sun can be compared in a single unit. That is money. A kilo of Onions is valued at 60 units of rupees. A car may be valued at 5 lakh units of Rupees, so on. 4) The money is there for us Citizens to exchange goods / assets conveniently using the unit of value which is rupee. 5) It is the responsibility of the govt to have enough units of its financial system that there is no shortage. (At the same time there should not be more money in circulation to inflame inflation). 6)As such it is my right to use my money (its not govts money. Its my money, only represented in govt denominated units which is rupee) as I wish. The only condition is I should not destroy it. Let me give an example. I have a house. If I say its my house, I want to burn it, no one allows it. If I want to rent it or sell it or donate it or convert it to dharma satram is my choice. Same way I can not burn money but spend as I wish, use it as I wish. As long is I am not burning it or insulting govt by writing bad things, it is perfectly alright if I scribble on it. 7) If RBI brings such rules, some one will file a PIL case. In the name of some flimsy excuse, if every organization brings out its own rules, it is where my rights are attacked. By the way many Bank cashiers write on the bundles the numbers or some thing. Its sad that educated people like you are behaving like kids by writing such things. Irrespective of what RBI says, you should not be scribbling on the currency notes as it definitely impacts the economy indirectly. If you are writing something on the notes and keeping it with you then its fine but if you spread those notes then its not the right thing. The age old habit surely needs to be rectified and hopefully this latest notice from the RBI will stop the habit in it’s tracks. One also hopes that bank tellers and cashiers across India will also stop scribbling numbers that they jot down on the topmost note of the various bundles in their drawers. There is no such rules from RBI, wotever we see in forums and social media is justa rumour. But the clean note policy is true. However banks will not accept it from 1st January is a totally misleading information. I just called my banker and he mentioned that there is no such RBI circular. @Arun, please verify the details of this post from your side and post an appropriate update. Just my 2 cents. Agreed to it, its all rumors getting spread across web.. This habit of writing on Notes is not good — however, even many bank people used to write on it & some still do. Are you sure this is going to happen & that too so soon? Daily newspapers (offline) haven’t covered this topic on large scale. I am sure RBI would urge them to print it on daily basic before implementing it. I haven’t seen much coverage on it. Did they spread it largely in Rural areas? Agreed… RBI needs to spread the word through mainstream media, no doubt about that… People in villages will be caught unawares if this happens… It takes lot of time for the message to reach inlands… But even with all that, I still think it is good…Because either way, if the word of mouth spreads, RBI will have to clarify it… from consumer perspective, they have enough time to give it to the banks…Deadline is still 40 days away… I think we Indians need to stop using notes as scribbling pads.. You will not see this ever happening in developed countries… And the worst thing we do is staple the notes, I dont know who the hell started that concept! Bingo. In any case, we all should should stop writing on currency notes & prevent anyone from doing it in front of us. Stapling has reduced by large percentile in last 2-3 years — RBI did clearly gave instructions to Banks regarding this then… which is good. Got the link to the RBI policy/circular on the Jan 1, 2014 deadline?